ACT are like. It’s a great reality check for just how much farther we have to go. Learn how homeschoolers register for the PSAT and about the National Merit Scholar program at our National Merit Scholarship Tips page. 2. Caution! Road Forks Ahead: Is a 4-Year College Right for You? Pull over now and answer these questions before you arrive at the fork in the road. 3. ACT 19, SAT 920: How Far Away Are You? Most Southern colleges use the ACT, while the SAT is used more in the Western and Northeastern states. The composite scores listed on this sign are typical thresholds needed to get into most colleges. Your PSAT score is a good indication of how you will perform on the SAT. Or, convert your score to an ACT equivalent at Studypoint.com. Now plot a standardized test study route that will ensure you meet these thresholds—or far exceed them—if you hope to score scholarships or attend a competitive university. Sign up to take the ACT or SAT. All but the child prodigies should plan on taking the ACT or SAT more than once, particularly if there’s scholarship money riding on a slightly higher score. Visit CollegeBoard.org and ACT.org. In the month leading up to taking the exam, allot approximately eight hours per week to building vocabulary, reviewing algebra and geometry, and taking practice exams. Also, answer practice ACT or SAT questions as a daily pop quiz, getting you into the mental groove of efficiently answering standardized questions. Take dual credit courses at a local college. There are so many reasons why this is a good idea, not the least of which is getting core degree requirements out of the way. This will either lighten your load later or free yourself up to take more of the classes you love in college. It is also a good opportunity to check out the local college and obtain college credits at a serious discount! Learn more at THSC.org. Take every opportunity to build your resume by participating in church, civic organizations, extra curricula, summer camps, and national competitions, and by joining honor societies. Read more about National Honor Societies on our website. You can also develop specialized skills via internships and apprenticeships. Join the THSC Rangers program or volunteer at our Conventions. Then, when you make a strong connection with a leader or mentor, ask for a letter of recommendation. 8. Scenic Overlook: What’s the Big Picture of What You Want in a College? Also consider worldview, clubs and intramural sports offerings, and Greek organizations (or lack thereof). 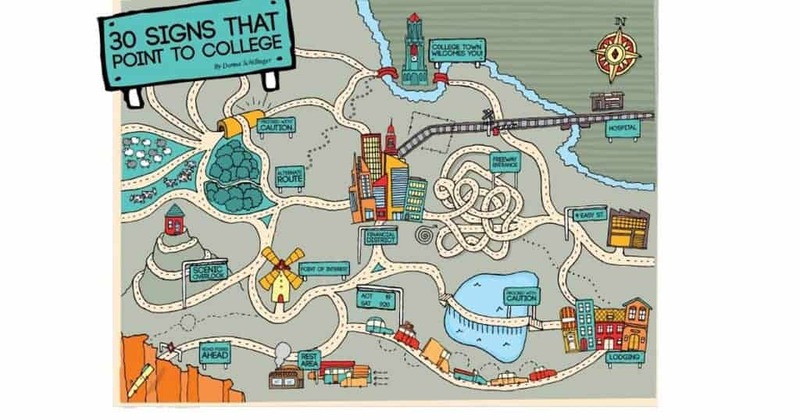 Use a site like College Navigator or Big Future to help you find colleges anywhere in the nation that fit your criteria. 9. Lodging: College from Home, Maybe? If after surveying the landscape, you wonder if you really want to leave home at all, there are other options on the path to college for homeschool students. While some brick and mortar colleges require freshmen to live on campus, it is possible to commute to other schools. This is beneficiary to maintain a stable home life and realize cost savings. Alternately, you can earn your degree online from home. Visit OnlineCollege.org and CollegePlus.org for starters. 10. Point of Interest: What Stands out in a College? Once you’ve narrowed the field to a dozen or fewer colleges that meet your criteria, browse each college’s website and create a “pros and cons” list. Create a point system, weighing your top priorities more heavily. If proximity to home is a top priority, give every school with that pro five points, and so on, until you’re able to score the schools and narrow your choices to about five. 11. Proceed with Caution: Do Your Top College Choices Have the Degree You Want? Make sure your top five offer your desired degree plan. Don’t worry if you haven’t yet decided on a major, though. Most degree plans require a distribution of core courses that build in time for students to weigh their options before declaring a degree, all while staying on track for graduating within four years. There are a number of directions you can go here, and none is wrong. Apply to your top five favorites before your college visits so that you can conduct interviews while on campus. You can always check out your desired schools first, then circle back for interviews. Think it through, factoring in how far away from home your favorite college choices are, as well as how much time you and your parents can spare for college visits. Transferring can be expensive and time-consuming, so don’t skimp on college visits. Contact your top five or more schools and set up a campus visit. There’s no better way to assess a school than to actually see and experience where you might be living for the next four years. Bonus: Colleges often give goodies to prospective students—anything from a candy bar to free lunch to a t-shirt. When you visit campuses, take time to visit with a professor in your desired major’s department. Or, sit in on a class. Depending on your career interest, you may want to learn the worldview or particular theories to which key professors subscribe. You should bring portfolios of writing, art, and more, and ask professors how to strengthen them. Also, do you have skills or talents that colleges will pay for through a scholarship? Schedule sports tryouts and music/theater auditions for during your campus visits. These visits should wrap up in September of your senior year. Once your Top 5 list of schools has emerged, apply to each of them, ideally by Labor Day of your senior year. Some schools charge an application fee. But, this toll is worth paying to see which school can make you the sweetest financial aid deal. Let’s pull over here and make sure our fluid levels and tire pressure are still good. Seniors often get so fixated on getting to college that they let grades slip a little. A strong finish to senior year is important because many scholarships depend on a certain high school GPA that includes that last semester of senior year. About 85 percent of college students spend some time here researching grants, scholarships, and loans. Let’s take it one block at a time. – First Stop: parents need to make sure they either file their taxes on time or have the data to make a close estimate when approaching the single point of entry to federal grants, loans, and work study, which is housed under federal student aid (FAFSA). By March 15 of senior year, complete this form at FAFSA.ed.gov. – Second Stop: By this time, your top five choices have either accepted or rejected you (hopefully in the kindest way possible). There’s a place in the FAFSA application where you specify where to send your Student Aid Report (SAR). It should go to any university you are still considering. The best kind of money for college is free money. The State of Texas offers a variety of grant programs for Texas universities. Some are based solely on needs, while others are based on need and merit. And yes, homeschoolers are eligible! Learn more at CollegeForAllTexans.com. Federal grants are based solely on need, and need is assessed through the FAFSA. When completed on time, you will automatically be considered for the Pell grant and other federal programs. The universities that have accepted you and received your SAR will automatically add federal funds for which you qualify to your financial aid package. You’ve met with coaches and choir directors and consulted the financial aid office at your top tier schools about competitive scholarships, right? Now go all the way down this street and search off the beaten path for sources of scholarships like church funds, civic organizations, essay or art contests, and special scholarships like THSC’s own Patrick Henry Scholarship. Make a spreadsheet to track scholarship deadlines and requirements so you only have to ask your references once for the number of signed original letters you’ll need for all the applications (among other reasons). If several scholarships require a general topic essay, write one essay, then adapt as needed. Prove you’re smart by having the best writer or editor you know edit your essay. Then, meet the deadlines. No one likes going this direction, but it’s often the most expedient route. Your SAR will include your eligibility for federal loan programs. Most will qualify for something, but if you don’t, call local banks to inquire about student loans if they are absolutely necessary. Also determined by the FAFSA process, students with need are guaranteed part-time employment, the wages of which can be applied to the tuition bill. This is an optional program with limited hours weekly and limited job opportunities. It may make more sense to get a regular part-time job and set up an automatic debit to pay on tuition. Financial aid offers from the schools you’ve been accepted to should be arriving spring semester senior year between March and May, assuming you filed the FAFSA on time. Send in your housing deposit and accept that financial aid package! Your destination is coming up in four months! If you decide to take a gap year (one year off between high school and college), be sure to complete all the steps for applying to college on the same timeline as if you were going right on to college. Then, contact the registrar and ask to defer enrollment for one year. Additionally, confirm with any non-institutional financial aid sources (state grants and private scholarships) that taking a gap year won’t jeopardize eligibility. This is the last stop in the financial aid district. Now that you know how much financial aid you’re getting, it’s time to figure out how much more you will need for tuition, living, transportation, mad pizza money, etc. And, where will that money come from? Plan on a full-time summer job and part-time employment during the school year. This added responsibility has actually proven to enhance academic performance. After high school graduation, it’s time to send the final transcript for both high school and concurrent college credits to the registrar’s office. Merge more credits by testing out of your best subjects, especially languages. Also, check with your college about which they will accept, then learn more about CLEP, Dante, and Excelsior tests for college credit from this Fast Company article. You should also be able to skip intro-level courses by taking placement tests. Now the fun part on the path to college for homeschool students begins. Attend orientation, preferably in the summer. Besides making friends, you will learn your way around campus and register for classes, which will ease anxiety about the big move and help you enjoy the rest of the summer. Some colleges assign summer reading for incoming freshmen, but you should wait to buy the rest of your textbooks until a couple of weeks before classes start in case there are changes to your schedule. Save money on textbooks by purchasing e-book versions, renting textbooks and purchasing used books. Don’t plan on stopping here, but just in case something happens, sign up for a student accident insurance plan offered by the university. This is especially important if your parents’ policy won’t cover a torn ACL from a flag football accident. 29. College Town Welcomes You! You made it! You’ll be on your own soon enough, so don’t ask Mom and Dad to drop you at the curb. Let them help you settle in. You will also inevitably remember about $100 worth of stuff you still need from Walmart. Show your parents how much you still need them by letting them take you shopping one last time. Head back to the financial district each March to renew FAFSA filing. This will ensure you remain eligible for important grants, institutional scholarships, loans, and work study. Now the path to college is clear for your homeschoolers. Start getting ready today for the next part of your education journey!